Officials from NASA’s Lunar Science Institute (NLSI), at the Ames Research Center in Moffett Field, CA, are conducting FREE public programs at the Grand Canyon Village Visitor Center during the event, including safe telescope viewing of the eclipse as it happens. 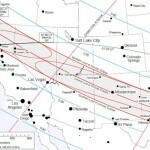 If you can’t make it to the Grand Canyon, there are other excellent locations for viewing the Annular Solar Eclipse. 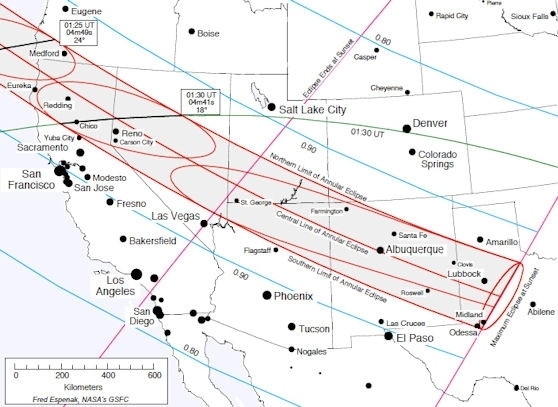 If you are within the 200 mile wide “path of annularity” stretching from Lubbock, Texas to Medford, Oregon, check around for observatories, museums, star parties or other organizations that may provide opportunities for viewing the eclipse safely. More information for the path the annularity can be found here. At the Grand Canyon Visitor Center, NASA scientists will offer short special programs periodically throughout the morning and afternoon. They will also offer 3 longer presentations about eclipses and recent discoveries about the moon and sun. Check posted signs for times. Seating is limited. For the longer presentation, free tickets will be available on a first-come, first-served basis starting at 8 a.m. on May 20 at the Grand Canyon Visitor Center. South Rim: Rangers, amateur astronomers and NASA scientists will collaborate to offer telescope views of the eclipsed sun, along with projected images and a limited number of “eclipse glasses” to share. The largest concentration of telescopes will be behind (west of) the Grand Canyon Visitor Center, but rangers and telescopes will also be located at Lipan Point, at the benches just west of the Desert View Watchtower, and on the deck of the Watchtower itself (brief looks only at the Watchtower as capacity is limited). Check posted signs for additional locations and information. More information on NASA at Grand Canyon.